Graves Motorsports BMW S1000rrFender Eliminator Kit. Graves Motorsports Fender Eliminators for the BMW S1000 RR are designed to eliminate the stock rear fender to give the bike a more race inspired look. 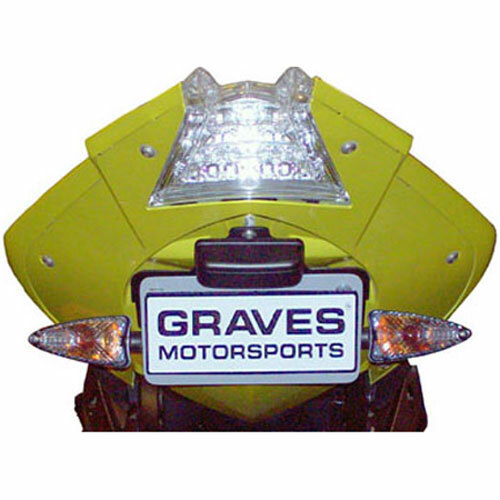 The Graves tag kit has been designed to use stock or aftermarket turn signals. All Graves Motorsports fender eliminator kits are fabricated from black anodized aluminum for long term reliability and great looks. There is no cutting required to your stock fender and all hardware is included for easy installation. This is the cleanest and most affordable S1000RR kit made.